Originally developed for demanding race applications, these premium Performance Gold Oil Filters are rapidly becoming a favorite among consumers for their 2007 Dodge Nitro. To satisfy the demands of consumers and racers, these K&N oil filters have many features over and above the factory requirements, including oil filtration performance and durability. 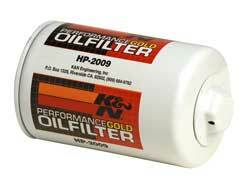 K&N oil filters contain resin-impregnated filter media to provide maximum oil filtering surface. All K&N oil filters have an exposed nut designed for easy removal.